The Squier Bullet Strat project is getting closer to how I wanted it to look like and play, but there’s a bit more work to be done. First up, the stock tuners had to go and I wanted to try and get some decent locking tuners that didn’t break the bank. The whole point of this project was to take a cheap guitar, and increase its playability with a modest budget. 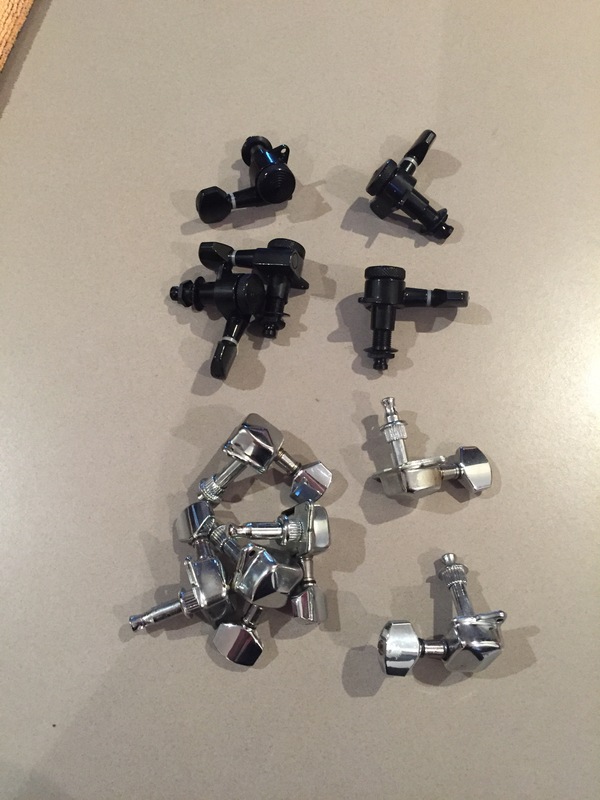 Scouring through eBay, there was a range of locking tuners at all different price points. I wanted to upgrade on a budget, but I didn’t want to risk going with a super-cheap no-name option and being let down. The established players were a bit too expensive for this build, so I wanted to find a good middle ground. Jinho was a brand that came up with options that were a nice middle ground for price, so I did a bit of reading up on them. 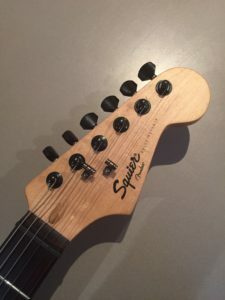 Turns out that Jinho are an OEM option for a range of big-name guitar brands, and the feedback on their locking tuners was generally positive. I ordered a set of these, and some roller string-trees, since they were very cheap. They were less of a loss if they turned out to be rubbish. To continue the black theme I ordered some black pickup covers to match the stock single coils to the IBZ/USA pickup, as well as some black pickguard screws. A lot of these things weren’t really necessary to the playability of the guitar, but I wanted to achieve a bit of a tuxedo look, and the overall cost wasn’t too much. The Jinho locking tuners were the first item to arrive. Like most modern tuners, the shaft diameter is 10mm, and I’d need to enlarge the tuner holes in order to fit the new units. The safest way to open up the holes without chipping the wood is to use a hand-reamer, but I didn’t have one, so I decided to try and to it with a hand drill and a range of drill bits that would gradually bring the holes to the desired 10mm diameter. Unfortunately, drilling the holes out gradually resulted in chipping, but thankfully most of the damage was covered up by the tuners themselves. Now that I think about it, masking off the areas may have reduced the chances of chipping, but it’s too late now. It’s not really the end of the world since it’s a cheap guitar. 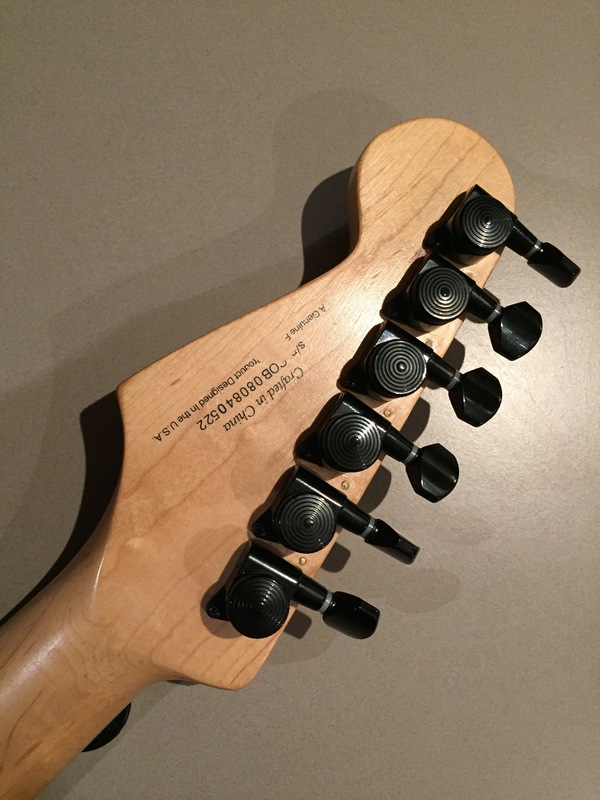 The stock tuners use two screws to hold each tuner in place. These holes didn’t quite line up with the 45 degree angle mounting on the Jinho units, so I decided to fill the holes to tidy up the back of the headstock. I used maple toothpicks, trimmed to size, and a bit of superglue to stick them in. Trimmed to be flush with the headstock, the holes aren’t nearly as noticeable as they would be if left alone. I put the Jinho tuners into the newly enlarged holes, and lined them up against a straight-edge so I could mark the spots to drill for the screws that hold the tuner in place. To drill the pilot holes the correct length I placed the screws to be used against the drill bit, and marked the correct depth with a piece of tape. By doing this you don’t risk drilling too far, through the headstock. Once the holes were drilled I installed the screws and tightened up the retaining nuts. Once the guitar was strung up and strings stretched sufficiently I went about testing the guitar. I was pleased to find that the guitar stayed in tune pretty well, even with some whammy bar work. The string trees were causing some string binding issues, as was evident by the pinging noise on some strings when tuning. The roller trees were on their way, so it would be interesting to see if they improved the issue. The next batch of parts to arrive were the black pickup covers and pickguard screws. I mistakenly figured that the Squier pickups would have had the same pole-piece spacing to save costs, so I only measured one pickup and ordered the covers in the same spacing. The cover fit the middle pickup, but the neck was off. I ended up widening the holes by scraping around them with a Stanley knife until I could fit the cover over the pickup. The modification wasn’t too noticeable since the pickup bobbin was black. The guitar was pretty much coming together visually now, with it’s black and white theme. The string trees finally arrived, and unfortunately I was a bit disappointed with them. They were supposed to be black, and they were closer to the nickel colour of the stock string trees than black. The heads of the screws snapped off during installation, so I had to use the stock string tree screws. To top if off, the tolerances on the rollers were a bit sloppy, so it feels like there is still a little bit of string binding going on. My first pick for trees was the Graphtech Black TUSQ XL Sleek String Trees, so I think I may order some of these soon. With the installation of these parts the guitar is not only starting to play better, but come together in a visual way too. 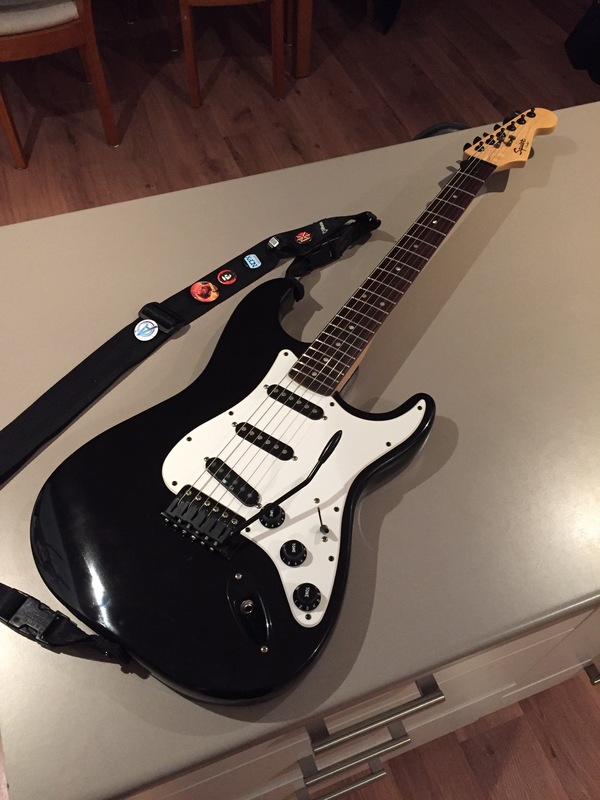 I want to continue replacing any screws on the pickguard to black to finish the look there, and most likely switch out the string trees for part that not only look the part more so, but perform better too. I took the Bullet out for it’s first gig during this time, and whilst it performed admirably, the IBZ/USA single coil in the bridge wasn’t quite pushing as hard as I would have preferred. I’m looking at a couple of pickups that may give me the bigger, fatter sound that would be comparable to my humbucker equipped guitars, but still retain a single coil vibe. The Bullet may be a cheap guitar, but it plays so well, so it’s worth considering throwing some nice pickups in. 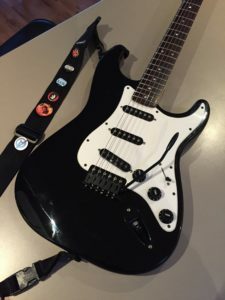 This project has definitely been a lot of fun, and has demonstrated that a cheap, budget guitar can be a great player with a little work and a small budget.